Whoa! These are not mainstream Republican views—at least, not any Republican mainstream post-Goldwater and pre-Tea Party. Even Ronald Reagan, who had once criticized Social Security and Medicare, was backing away from those positions by the 1980 presidential campaign. …Perry’s ideas range from wrongheaded to terrifying.…The subtitle of Perry’s book is “Our Fight to Save America from Washington.” Reading it summons the image of another, urgent fight: saving America from Rick Perry. Here’s what gets me. 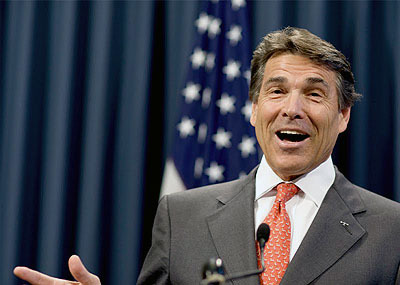 Perry’s views are getting denounced by all the usual lefty suspects but not much by anyone else. And the reason for this is something very odd: In modern America, conservatives are largely given a pass for saying crazy things. They’re just not taken seriously, in a boys-will-be-boys kind of way. It’s almost like everyone accepts this kind of stuff as a kind of religious liturgy, repeated regularly with no real meaning behind it. They’re just the words you use to prove to the base that you’re really one of them. Why is this? I’m not quite sure what the left-wing equivalent of this would be, but it would be something along the lines of Hillary Clinton writing a book that proposed repealing the 2nd Amendment and adding one that banned hate speech; limiting defense spending to 2 percent of GDP; raising the top marginal tax rate back to 90 percent on millionaires and 100 percent on anything above, say, $10 million; instituting British-style national health care; and spending half a trillion dollars on new programs for universal preschool, two-year paid leaves for new parents, and an increase in the minimum wage to $15 per hour. But in real life, Dennis Kucinich wouldn’t support a platform like this, let alone a front-runner for the presidential nomination. And if one did, he or she would be instantly tarred as an insane nutball and would never see the business end of a TV camera again. But when Republicans say the mirror image of stuff like this, it just gets a shrug. Sure, Perry apparently wants to roll things back to about 1900 or so. But hey—it’s just a way of firing up the troops. Nothing to be taken seriously.